Decals Rock! Here I am worrying about how to get my Angels Sanguine logo onto my marines, thinking I can draw it on, paint it freehand, I can try to make a press mold and make greenstuff icons, or I can cut itty bitty stencils and airbrush it on..Ha fat chance any of those ideas wouldn't make me go insane. So I went cruising for decals. My favorite and in my opinion, the best and most exhaustive resource for decals, is definitely: Ye Old Decal Project on Bolter and Chainsword. The repository, by a great set of guys pulled from personal works, and the works of others around the net. this is THE place to go in my opinion. It not only covers Power Armor, Pre-Post heresy, Chaos, and pretty much all Imperial icons such as the Inquisitorial Ordos and overall Imperial type Aquila and such. The best part is, its super organized and really easy to use. As a side note, for all the xenos, there are plenty of fonts and glyphs that can be found on the net that can be printed in any photo program. I will work on those soon with my Eldar. I'll update this post and link em at that time. And who knows we may have some fantasy OnG glyphy stuff too. So, I started by perusing their exhaustive list of Imperial Marines and found an Angels Sanguine one I liked. This one in particular made by Tubal. You can find the full .zip it here. 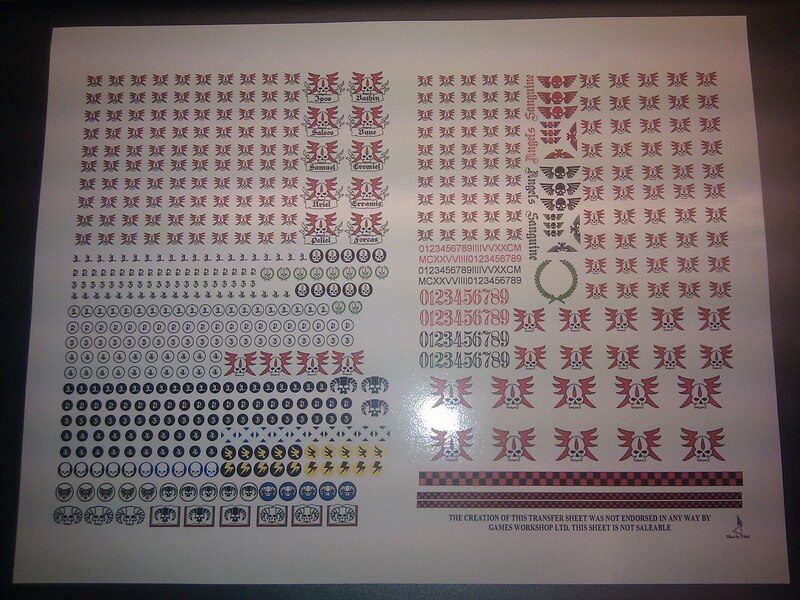 So I love the decals Tubal made, but I felt I needed more specialized icons for my squad markings and banners. So I fired up my photo editor. Browsing around the other decals that the team at BnC put together, I found the Deathwatch decal set, and the Deamon Hunters Set. I also stole the army badges of lighting bolts and wings from the standard Blood Angels First Company Sheet created by the gang at BnC. 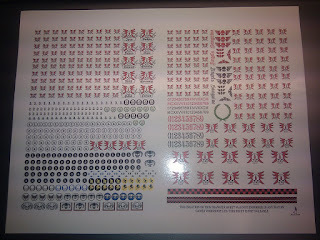 Cutting pasting, and reorganizing these decal sets I created icons for my Librarians, Sanguine Priests, and Veterans. I even customized a few skulls and numbers for my Vanguard vets using the Wreath Icon from the Initial AS set and the skull from the Chapter icon itself, minus the wings. I really like the standard Gothic font numbers used on the generic sheets so I scoured the net for the 40K number font. Putting the numbers in circles or with round backgrounds allows me to place them as banner icons as well. Lastly, the printing issue. Following the tutorial on the BnC thread I began to look for some decal paper. They recommend printing both on clear and white paper. White paper is good for solid colors and whites, as printers do not print with white ink. I first decided to start out with white paper and if it works out, I'll do the same printout on clear as well. A few minutes on EBay, and I had some white decal paper. It's usually about a buck a sheet, and prices vary but I was able to get 10 sheets for 16 bucks, including shipping. I added my sheet next to the default sheet from Tubal on BnC on the right. I now have 150 shoulder pad sized Chapter Icons, one decal for each of my squad banners, various squad number markings, and plenty of army badges. Next step is to make a Chapter Banner and some custom Decals for the vehicles. I will experiment with the decals, but I might have to bite the bullet and do some freehand if I want my vehicles and big banners to pop. there are awesome Army banners and badges that were created by the Dawn of War Community. I have began my research and will plan to go down the hand painted route as expertly explained by Ron here. 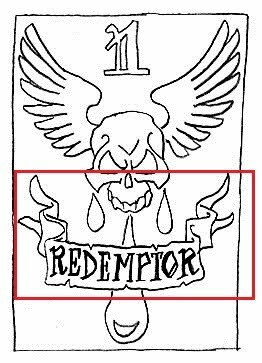 I will make line drawings out of their Angels Sanguine Chapter Banner (as the DC one is already good to go Above) and do them by hand, with a few practice ones, of course. They have a really small resolution, as they are used in game, but I feel theres plenty there to do what I need. Anyone else mess with custom decals or working with custom Icons and badges? I plan to do some hand made ones for my Eldar in the future. That will be plenty of fun. Post links to your work and maybe we can get some links together and share resources with the group. If anyone wants copies of my custom sheet, or the .ttf fonts I found, please feel free to PM or email me and I will send them to you. Dawn of War Community Banners resource. Ron's Awesome Banner Tutorial here from the FTW tutorial list found here. What was the font used for the numbers? I'm in the need for custom ones for my Ultramarines.